Many of us grew up being part of soccer leagues, little league or going to sports camps. It wasn’t such a big deal. However, for the boys growing up in the orphanages in Seoul, it’s not something they get to experience. However, in July, Jerusalem Ministry holds a soccer camp for boys from the different orphanages in Seoul. They get to wear fancy new uniforms and soccer cleats. They get a coach and play in a soccer tournament. It’s something that many of them look forward to all year. This year, the soccer camp is taking place from July 18-20th. It will be on the Yongsan military base. They are hoping to get about 40 volunteers and 44 students to participate. They are also looking for organizations that are interested in helping sponsor this camp as well. A few years ago, Smokey’s Saloon (burger place) sponsored a dinner for the winning team and coaches! Even though both Melody and I will be back home in the States, we hope to spread the word about this camp! This is a great chance to get involved in this organization especially if you enjoy soccer and are interested in coaching a team. I know you will have an amazing time with these incredible kids! For more information, please go to their website. Here is a video from last year’s camp! 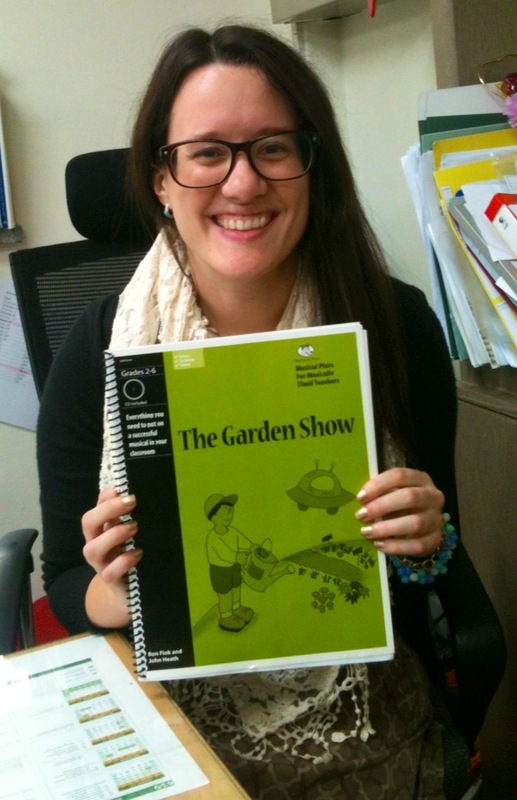 A Musical for 2nd Grade All About Plants! You may have notice my shortage of posts over the past couple weeks (good thing I know Jee Young will always hold up the fort^^). Believe me though, it is not from a lack of things to share. As teachers, we all understand what a crazy/busy time the last month of school is. So— why. WHY? Did I think it was a good time to put on a musical? I have been asking myself this question for the past two months. Today is a national holiday in Korea (being an international school we didn’t have the day off), and because of that we had the largest turnout of parents come to our students’ performance yet. There is nothing more rewarding than seeing so many parents come out to support their children. They were very impressed, as they should be, since the second graders did and AMAZING job! We learn about plants during spring time in second grade, so this musical fit with our benchmarks and standards perfectly! Learning through songs is just one of the many ways we learn. What is your favorite way to teach? A few days ago, I was looking to see what movies were playing in the local theater in Korea and I came across a movie called The First Grader that was coming out soon. I clicked the link to the website and watched the trailer. After watching the trailer, I knew I had to watch it. So I checked iTunes and saw that I could rent the movie. This is a story I remember hearing about a while ago. This is based on a true story of an 84 year old man living in the rural parts of Kenya. He wants to go to school after the Kenyan government announces free education for everyone. He desperately wants to learn to read and enter the 1st grade. There is a lot of opposition and challenges that he faces on his journey. This is a remarkable story of a student and a teacher fighting for the opportunity of education for all. As a teacher, these are the stories that inspire me and remind me of the impact I can make. Once a year, our elementary school has a school wide publishing party celebrating the art work and writing of our students. This was the second year that we did this celebration. 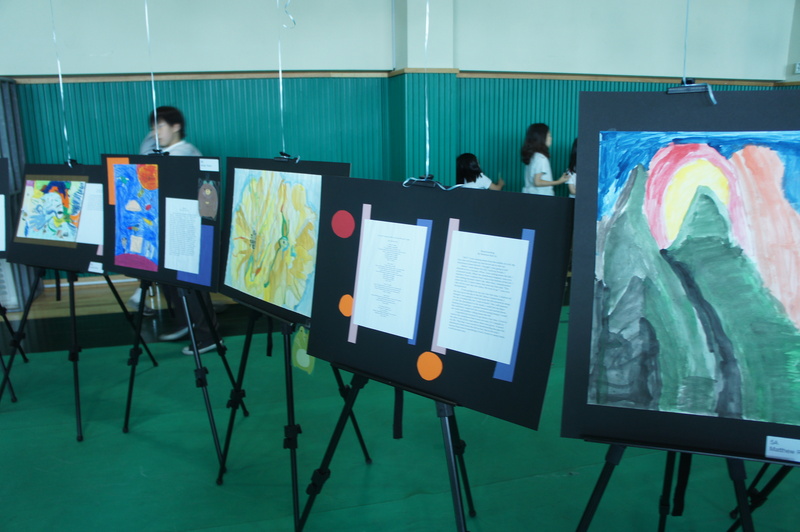 For the first part, the students had a chance to go to the gymnasium where all the students had an artwork and a writing piece on display. The PTO does an amazing job volunteering and helping this publishing party run smoothly. Afterwards, we went to the auditorium where we had a special presentation. Last year we had a famous Korean children’s author come in to share about her writing. She also happens to be a parent of one of the kids at our school. She wrote a book called Cloud Bread. This year, we had another parent come in who is an artist. She does a lot of sculptures. I really enjoyed watching her presentation about her different art work. She did a series on fractured fairy tales. 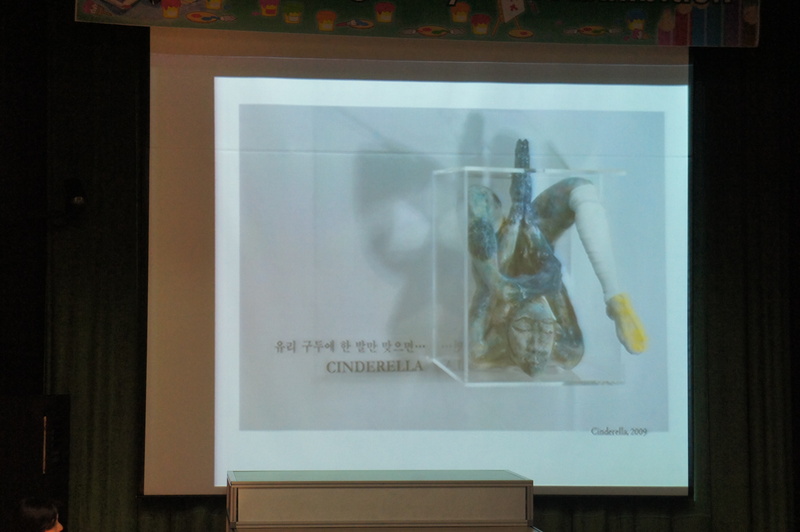 I liked her “Cinderella” sculpture, where she is stuck inside a glass box, and her leg is broken trying to fit inside the box. 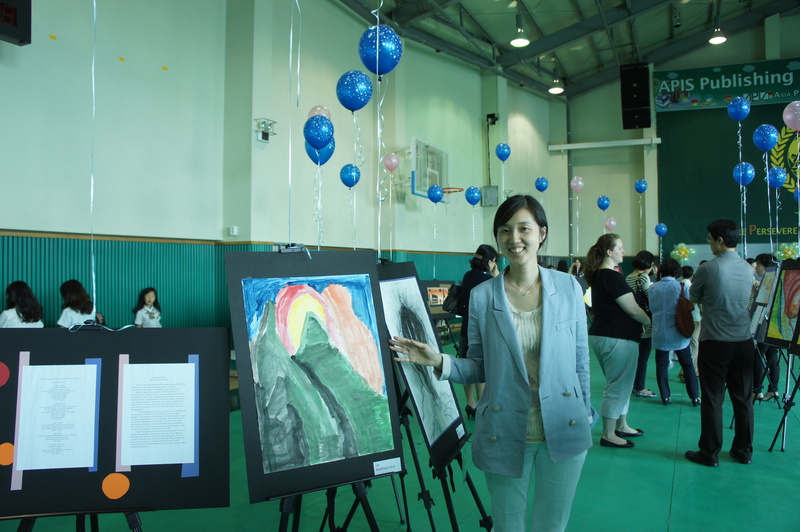 This was a really a fun and special day to be able to recognize the hard work the students do in their writing and also in their artwork! Well, all good things must come to an end… and our poetry unit is no different. 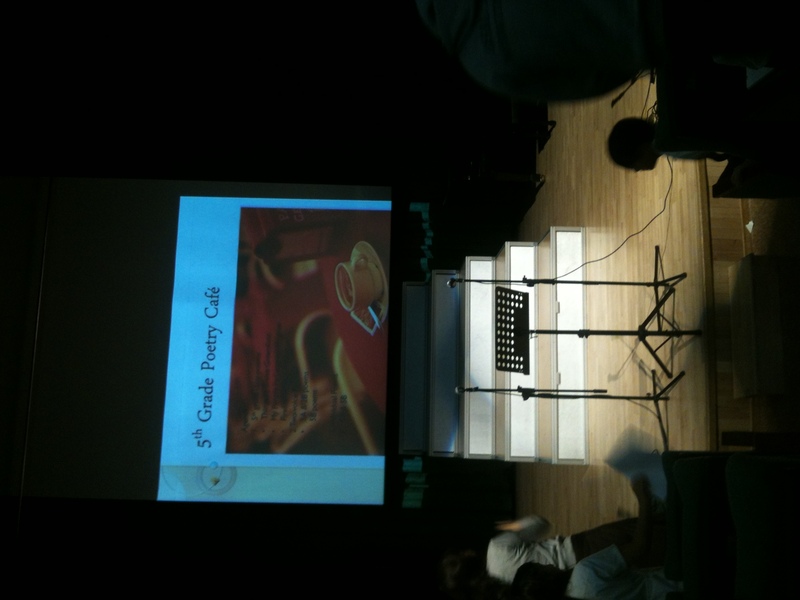 Every year, at the end of her poetry unit, Jee Young holds a poetry cafe (as mentioned previously here). This year, I was super excited for it because she asked my class to be a part of it! The event was held in our school auditorium and it started with all the fifth grade students on stage, reciting poems to the audience. It was incredible to see so many students on the stage performing poetry pieces that they had memorized by heart. After that, my students joined their book buddies, and one by one (or… should I say, two by two) they recited the two-voice poems they had been working on for a couple of weeks. The idea of getting on stage with their book buddy, and reading into a microphone, was so significant for my students. What a great way to feel accomplished! After the two-voice poems, every fifth grader got on stage and recited a poem they had written during the unit. The other second grade teacher and I were so inspired by the event, we are hosting a mini-poetry cafe with our students next week! We are going to bring a microphone into the classroom, invite the parents, and have our publishing party in that style. Oh, and what I loved most about the fifth grade poetry cafe is when the two fifth grade teachers got up and recited an inspiring two-voice poem they wrote for their students! Talk about a tear-jerker. Do you have any great ideas for a publishing party? Please share! p.s. Oh, and I had an amazing birthday last week!!! 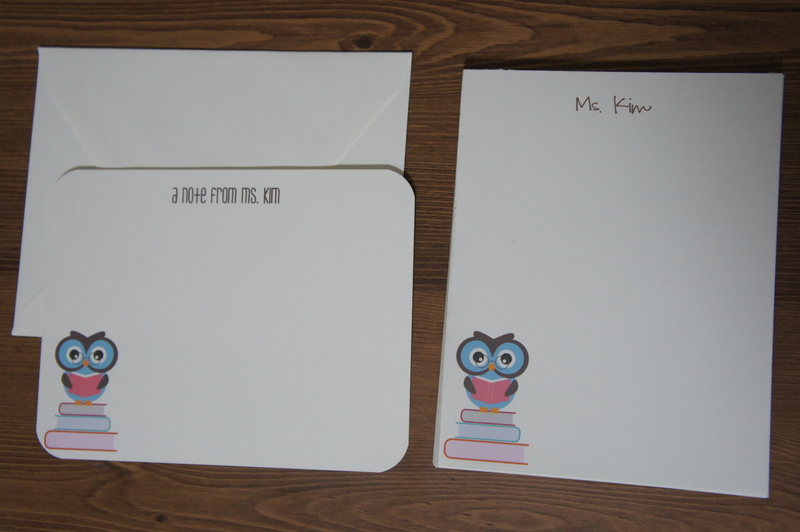 I especially loved my personalized stationary— Jee Young is awesome! It’s always a struggle trying to figure out what to gifts to give, especially your teacher. Well, let me help you out! As a teacher, I always like getting personalized items. A few months ago, I was searching for personalized thank you cards to order, I came across this seller on etsy: hedoe precious paper. I immediately loved their designs and simple style. I decided to order myself the owl notepad and thank you card set. You can order these cute personalized notecards and blank card sets with your teacher’s name and I’m sure they will love it! I’m always in need of thank you cards. Oh, and in case you didn’t know, it is someone’s birthday today! 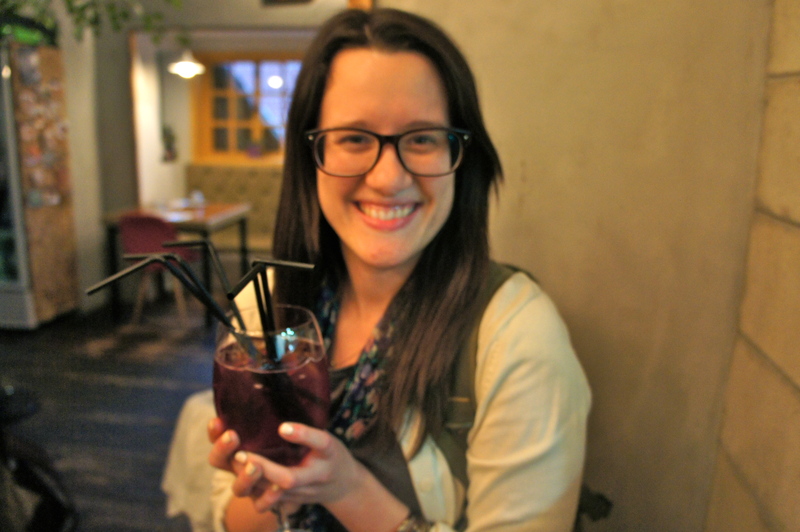 Happy Birthday to Two Apples a Day co-creator, blogger, and best friend, Melody! For our Colonial America unit, there are a few fun activities I like to do with my students. These activities were introduced to me by Mela, my 5th grade teaching partner 2 years ago! We do a few Colonial type of activities to help our students gain a bit more perspective on what life was like. We have them make Colonial style hats, sew pockets, create journals that they bind with string, make homemade ice cream and do a stencil activity with paint. During the Colonial time, the pineapple was a symbol for hospitality. 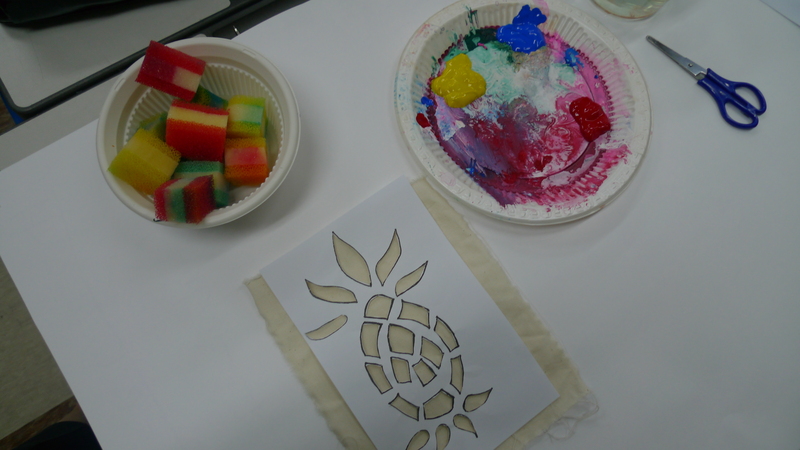 I had copies of a pineapple stencil ready for each student. I cut rectangular shaped pieces of ivory colored fabric for each student. 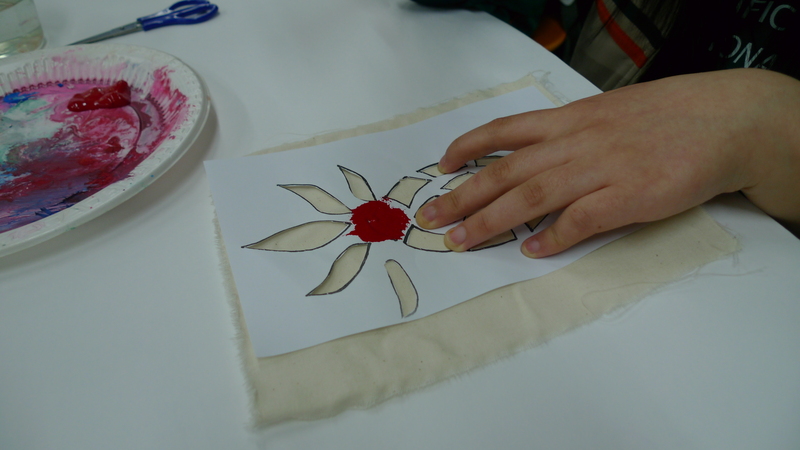 First, the students cut out the inside of the pineapple. Once they finish cutting it, they taped it on top of the fabric. 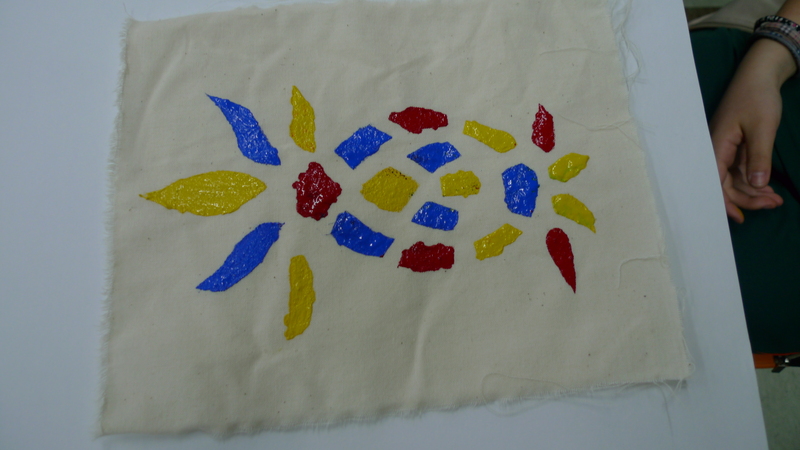 Then, they used sponges (I cut up normal sponges into small square pieces) to color in the inside of the stencil. Make sure to tell them to dab lightly. 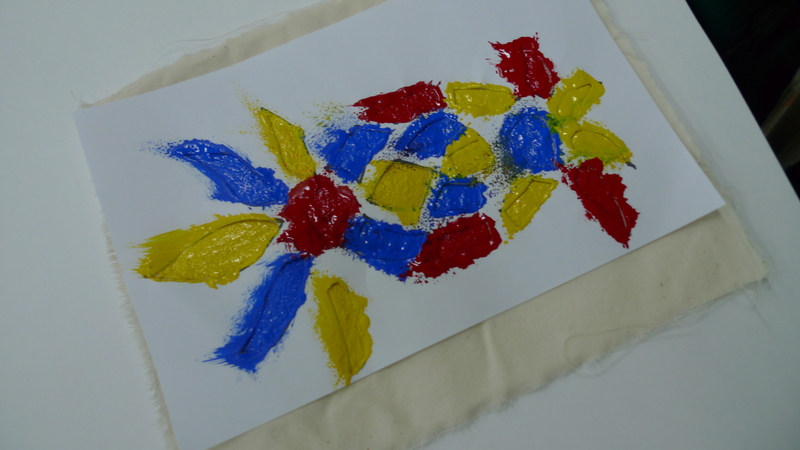 I gave them red, blue and yellow colored paint to use. After they finish painting their stencil, they take off the paper and let the stencil dry.